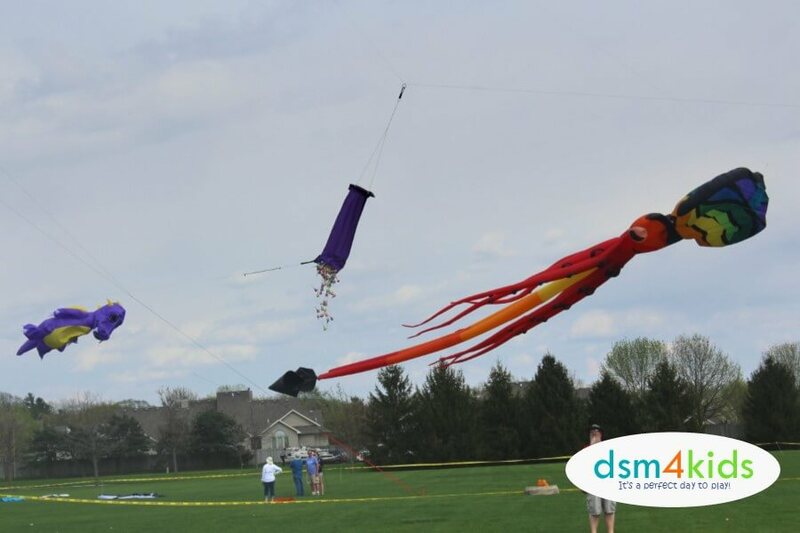 Since 2014, Kites on the Green has been bringing Johnstonians of all ages – and their kites – together to enjoy a day of kite flying, live entertainment, and tons of FREE activities for families and children. Organized by the City of Johnston, the festival takes place at Johnston Commons by the Johnston Public Library and the Simpson Barn. My daughter and I had a blast attending the event last year. 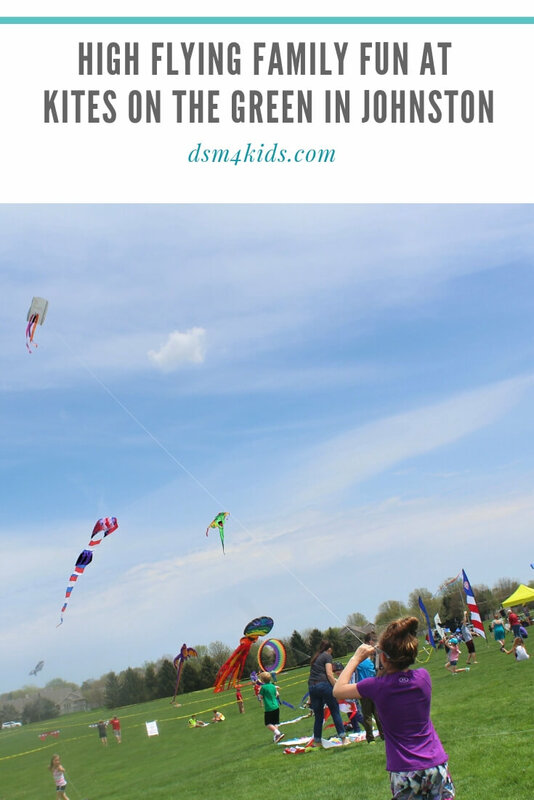 We both love watching and flying kites, but any family-oriented event filled with fun activities and is FREE always sounds like a good idea to me;). We lucked out weather wise, as it was a lovely enjoyable spring Iowa day! If you’re looking for more activities similar to Kites on the Green, be sure to visit our Event Calendar and Spring Fun Guide. Let’s Go Fly a Kite in Johnston! This year’s event takes place on Saturday, May 4, 2019 from 10:00 am to 5:00 pm. Find a printable schedule of events here. Kites on the Green takes place at Johnston Commons at 6700 Merle Hay Road (near the Johnston Public Library). Visit the City of Johnston’s website or call (515) 278-2344 for directions or additional information. This is the best part, it’s FREE! No tickets required. However, it’s a good idea to bring some money for food, drinks, and souvenirs. There is plenty of FREE parking available around the event. Outside food and beverages are permitted and it’s a great time for a picnic. However, if you forget to bring something or would rather let someone else do the cooking, there are food vendors available. Indoor restrooms are available at the Library. And there are also porta potties available. If you have kiddos that are potty training or wait to the last minute to tell you they need to go, you may want to have a conversation with them that they need to tell you sooner rather than later, because you may need to hoof it across the field to get to a restroom. Johnston Commons was already packed with kids and adults when we got there at about 11:00 am, and the sky was filling up with colorful kites of different shapes and sizes. Every type of kite you can imagine dotted the sky, from traditional diamonds to famous character logos to intricate box kites. 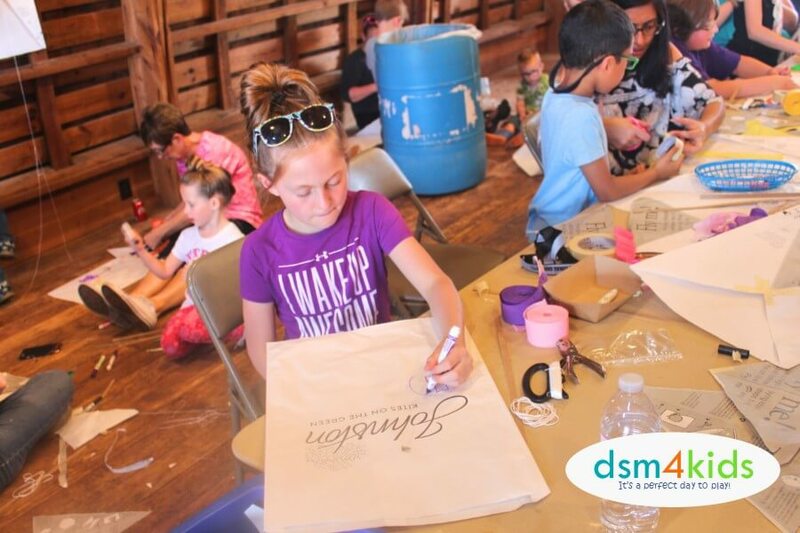 We started off our time at the festival in the Simpson barn by making our own kites. The volunteers give you a FREE kite making kit and there are several supplies available to make your kite and decorate it. It’s quite an ingenious and fairly easy “craft” that we enjoyed making. I must admit, I was a bit skeptical if our creations would fly or not, but they did, and quite well! Our intent was to stay for a couple hours, check out the kites, and then head home for a late lunch. However, the event offered so much to do and see that we ended up staying most of the afternoon. While kites are the obvious focus, there is also live music and performances to enjoy as well as a few vendors selling kites, gear, and other miscellaneous items. There are also a variety of children activities like face painting, really cool bol races and a very fun candy drop. Seeing so many different kites soaring through the sky was incredible, and the whole event made for a very relaxing, unique way to get out of the house and enjoy a family-filled May day. The event is FREE and open to the public, but it’s a good idea to bring some money for food or drinks. Feel free to bring along a picnic or snacks. Guests wanting to participate in the kite flying are encouraged to bring a kite, but if you don’t have one, there are kites available for purchase at the festival. 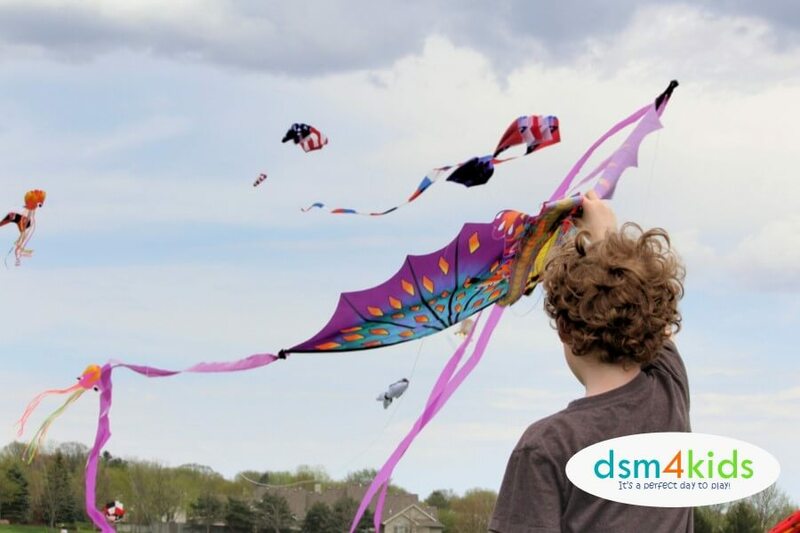 Pack the lawn chairs or a blanket, so you can find a great spot to watch the kites. Don’t forget to wear sunscreen and bring along sunglasses or a hat. Have you taken your kiddos to Kites on the Green? Let us know what you thought!